Remember your special dog with the personalized, Have You A Dog In Heaven memorial stone. The heavy duty garden stone is crafted of cast stone concrete and proudly made in the USA. Have you a dog in Heaven, Lord? Is there room for just one more? and will be waiting at your door. 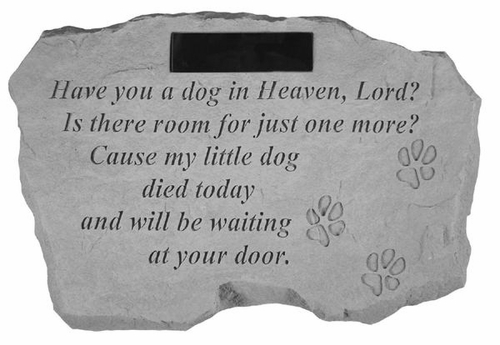 Memorial stone measures 16" x 10.5"
Customer orders ship within 2-3 weeks of order. Ships directly from the manufacturer.